TYM 394 with grapple. Thanks Billy now my back can rest. Very pleased. From the first words spoken over the phone, to finalizing the deal and getting our newly bought tractor delivered, it has been a privilege and a pleasure to work with Billy Smith and his awesome staff. Everyone I spoke with has been extremely helpful and knowledgeable in their expertise. Going beyond I did not expect so much form people who I just met not even an hour ago. Smiths Enterprise and its staff if professional to say the least, with a great community vibe! I wanted to say thank you for the phone support I got from you and Tony over the weekend. The filter has one drain plug and it is protected under a thick piece of metal with two holes that do not align with the drain plug (I guess it was installed opposite to the way it was supposed to be to access the drain plug, the holes are not symmetrical). I managed to access it and changed the oil successfully. I wanted to say "Thank you" to Tony who has been extremely helpful. On another note, the tractor is working perfectly and has been an enormous help around the farm. Don't know what to do without it. It is a work horse and the attachments are also wonderful. Thanks again and I doubt that I will need to b other you again with questions. This one was not as shown in the paper or electronic manuals. 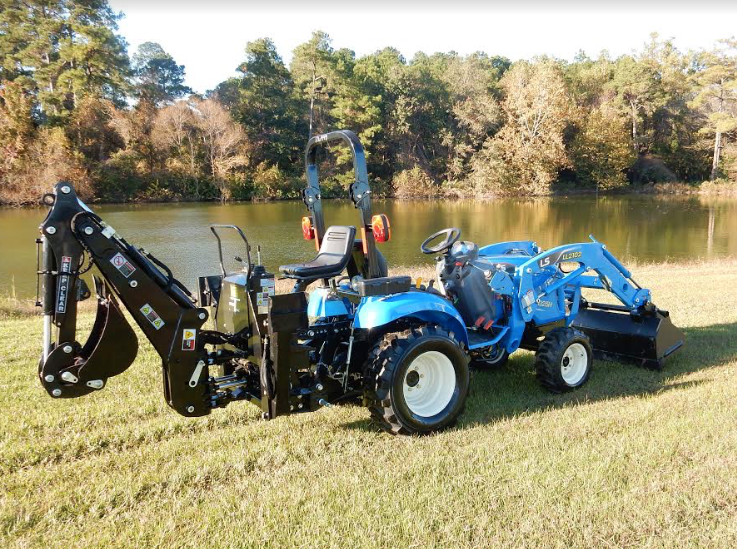 Dear Mr. Smith, I purchased an LS tractor package from you a week ago consisting of a LS XG 3025 with FEL, a Andy 5' brush cutter and a new dual axle trailer. I just wanted to send a message back to you to let you know that I am very pleased with the results of the equipment I received and also I'm pleased with the service you and your staff provided. Amy, Tony, Humberto, your lovely wife and of course, yourself, made me feel right at home.The tractor is beyond my expectations in doing everything asked of it so far. Your competitors efforts to talk me out of doing business with you proved to be futile as I was extended a fantastic price that none of them came close to meeting. I hope to get years of service out of the equipment and will not only return to you for any future purchases, I will let anyone looking to buy a tractor know to certainly not fail in contacting Smith Enterprises for their needs. They will not be disappointed. I purchased this LS R 4041 from Smith's Enterprise , I shopped a local dealer and Smith's BEAT the PRICE by a couple thousand with FREE delivery and FREE tank of Fuel . they even offered a 90 Day FREE exchange. I can tell you I would not Trade my LS for any other tractor I know of. As you can see by the pictures the LS R 4041 will pick up large bales of hay with no problem. I can tell you Smith's is the one to go to for an LS Tractor or attachments. Here are the photos you wanted. It didn't take long (1st time) to forget to put up the brush guard after cleaning under the hood and bending it. Bad design. My fault, hind sight I would have taken it completely off, I don't need it at this time. I am hoping that all I have to do is bend the bracket back and get new bolts for it. I have moved a lot of dirt and taken out a couple of tree trunks. I like it a lot, it has saved me a lot of manual labor. Thanks for all your help, you stuck to your word, you were professional and pleasant to talk to and you delivered before the due date even though it was raining. I will be getting up with you on future attachments. I would like to say that it was a pleasure to do buisness with you. The LS R3039H is an excellent machine and I am very satisfied. Delivery arrived on time and the guys were professional. Your a buisness that I would recommend to others in the market for a new machine. Hi Billy, thought you like to know my LS G3033 tractor and Long Grapple are working well. I started removing some trees out in my pasture. I took a photo thought you like to see it working hard for me. Also Nelson from W.R.Long helped me trouble shoot Valve Kit problem, all is working fine. James said he was very pleased with his 433 Cabn TYM tractor, he said it had more room than the 80 HP Kubota he used at work. He wrote he was treated with respect during and after the sale and would recommend Smith's Enterprise and TYM to others. His father is even thinking of trading in his Kioti for a TYM 433. He wrote the vehicle was described and represented as he was expecting. James purchased a Cabin Jinma from us and broke the record on trading in within the 90 day FREE Exchange we offer on all sales. Just wanted to drop a line tell you how very satisfied I am with my new LS G3033 Tractor I bought from you. I mowed my pasture the other day and it performed flawlessly. I am very happy with the deal you worked out with me and know you out did yourself keeping the price affordable for me. I was pleased with the weight you added in the tires, it hugs the ground and has a good stable ride like you said it would. I thought the clipper mower was surprising smooth and did fine job mowing down my pasture. I believe the bucket will give me some options of moving materials around helping me in many ways to improve my land in the future. I recently purchased a tractor and several implements from Smith Enterprises. I worked with Billy Smith through e-mails and phone calls and things couldn't have gone any smoother. Billy is a pleasure to deal with. He bent over backwards to see that I got everything I wanted and personally delivered my tractor. I would HIGHLY RECOMMEND dealing with Smith Enterprises. The prices are more then reasonable and my friends are in awe of what I received for the money. I also have a few friends who wish they had found Billy before they made their purchases of tractors. I am in hopes of sending more business his way. If you are looking for a tractor, as far as I'm concerned, this is the only game in town. GREAT GREAT SERVICE. Once again, It was a real pleasure doing business with you Billy and I couldn't be happier. I am writing to commend Tony Odom parts manager for your company. I purchased a TYM433 tractor from you in May 2011 which you delivered to me here in Mississippi. Overall the tractor is great. I put it through a lot and it handles the load. I would like to commend Tony Odom parts manager for your company. I have had some maintenance done on the tractor with a few warranty issues and all in all they were dealt with in a timely fashion with the help of Tony. The local repair facilities in the Miss area where I live had a few problems getting the necessary parts to fix the tractor from TYM. So I contacted Tony and he came through with the parts necessary to take care of the problems. He has also been able to answer or get the answers for anything I may ask in regards to the tractor operation and or parts needed to be replaced and follows up to return phone calls if and when I leave a message to be called back. This does not happen often with other companies. You and your company personnel have stood behind the product you have sold and have made sure that any and all warranty and non warranty issues are dealt with and taken care of. Mr. Oscar was the salesman for me when I purchased this and he also has been helpful with answering any questions I have had. Your personnel are very knowledgeable with this particular tractor. And to have the owner of a company as yourself take time to call back and speak to a customer which you have done shows a lot for the customer care your company provides. Other companies could and should learn and or take notice to this. It is and has been a pleasure dealing with a company who stands behind with what they sell. And gives customers comfort in knowing they won’t be abandoned or ignored after they purchase a product from you and your company. Billy, we really appreciate the customer service/ delivery/ follow up with our new LS 38. It's working great, and we really appreciate you taking care of us. I still need a box cutter and one of your sheds, and hope your taking care of my Road King Custom!! Again, many thanks and more to follow. Thanks Billy for delivering the tractor, especially in the time frame and cold. I have not used it much, but so far am pleased. Hope your wifes surgery went good. I heard about Smith's from a friend, I had outstanding service and was treated with respect during the sale. I would recommend Smith's enterprise to others for a good deal and excellent service. This is Scott Truman from Columbus, Ohio although you delivered my TYM 353 to New Martinsville, WV. First, on several occasions now I've been forced to contact Oscar because of tractor problems. The first problem was unrelated to the tractor, but Oscar still happily provided invaluable aid...thank you!!! The second time the front steering hydraulic pump apparently fractured internally. Once again, Oscar walked me through mechanically trouble shooting the problem to what I hope was as successful conclusion. My point of this is to let you know how reassuring it is to have someone like Oscar so available; that's reassuring when a tractor is purchased from out of state. Second, I love the 353 but am interested in moving up to a 50-60 horse power TYM. I will either do this by trading in my current TYM, or more likely just buy the second tractor. To that end, I would appreciate you providing me a price on the described horsepower TYM..with and without cab, but WITH a front end loader. I also purchased my TYM 273 from Smith Enterprises. I had no problems Billy was a nice guy and when I had any warranty issues he shipped me the part and I installed it myself.